Welcome to back to Penny University! If you haven’t check in during the last week, be sure to check the post Research Blogging to learn about a great service for finding blog posts on peer-reviewed research (<spoiler> we’ve been approved to use it </spoiler>). Now, on to this week’s interview! Wow, this sure is strong coffee. MAGNETICALLY STRONG! Laura Roberts Artal is a PhD candidate at the University of Liverpool. She is studying 3.5-3.2 Billion year old rocks in South Africa to see what they can tells us about what the Earth was like, relatively soon after its formation. LRA: I am interested in how the Earth’s magnetic field works and more importantly, what it can tell us about what the Earth might have been like soon after it formed. The rocks I study come from the geological time period, called the Archean, a period of time from which we know very little about. This is mainly due to the fact that very few rocks from that time still exist today. Because they’ve been around for so long, they’ve also seen a fair bit of action: they’ve been buried to great depths, brought back to the surface; folded, tilted…you name it! I am lucky to work with some rocks from NE South Africa, which haven’t been too badly affected by these processes. From those, I’m hoping to gain information which might tell us more about how the Earth was all those billions of years ago: did plate tectonics exist as we know them today? Did the interior of the Earth (the core) behave as it does now? Were the conditions on Earth favourable for the first forms of life to start developing? AA: Wow, so you’re really digging into the history of the Earth, aren’t you (sorry for the pun)? What exactly do you do with the rocks you study, in order to find more out about these processes that have occurred over time? LRA: We need the samples we work with in the lab to be a standard shape and size. Standard meaning: 1 inch in length and width and perfectly cylindrical. So, we take a drill (not dissimilar to the ones used for DIY, just a little more powerful) out into the field and collect the samples. Once back in the lab, we carry out a bunch of experiments to get as much information about the rocks as possible. 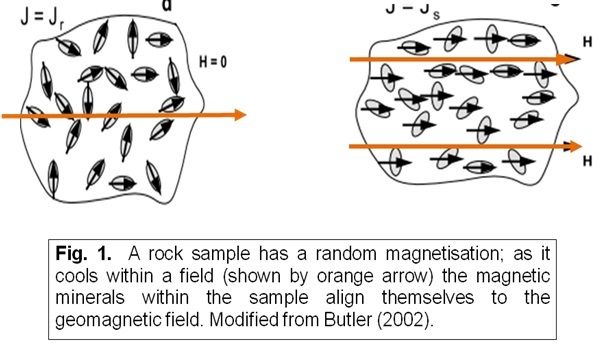 The main (and most time consuming) experiment I perform aims to find the original magnetic signature held within a sample. To extract this information, I heat the sample up to 600°C, but in 16 heating steps. We do this in an oven which is designed to cool very fast once it’s reached the desired temperature. In between each heating step, I take the sample and measure it in a magnetometer, which essentially reads the magnetic information held in the rock. The data is shown in a graph, which I then go off and interpret. I would always do this experiment last, as the heating process, ultimately destroys all the information held within the sample. If I wanted to run any other experiments on the sample, I’d do those first. AA: What exactly does the repeated heating do to the sample that allows you to gain useful data from it? Any why 16 steps, instead of 15 or 17? LRA: So, I’ll try to keep this simple, but we are going to have to go into a little detail of how rocks hold magnetisation for me to be able to answer this question. As a rock cools following its formation, the magnetic minerals within it align themselves with the local geomagnetic field. The aim of most palaeomagnetic studies is to measure and interpret the components of natural remanent magnetisation (NRM). A primary NRM is acquired during rock formation whilst a secondary NRM can be acquired subsequently; for example as a result of the rocks folding or being struck by lightning. Heating a rock to a temperature below its Curie Temperature (Tc= the temperature at which all ferrimagnetism is destroyed), then allowing it to cool in zero magnetic field, allows removal of the secondary NRM and isolation of the primary NRM component. The primary NRM is what I am interested in, because it is the record of that really old magnetic signature that I am after! The number of steps you carry out, really depends on the rocks (or materials) you are working with and what information you want for them. In my case, the 16 steps are associated with this Tc that I talk about just above. I need to heat my samples to at least 580ºC if I want to isolate the primary NRM and I need to have a number of detailed ‘ish’ steps at lower temperatures to be sure I will be able to see the secondary NRM also. AA: I think many of us will have heard about that fact that the Earth’s magnetic poles shift and in the past have actually been reversed – is this the type of information you are looking at in the rocks? LRA: Yes, that is correct. The Earth’s magnetic field poles are always on the move, via a process called True Polar wander. Associated to that is another process called Apparent Polar Wander. In addition, the poles can flip, which is a reversal of the magnetic field. You’ve hit the nail on the head in your question; I am in fact looking for evidence for all of those, especially for a reversal. AA: That’s absolutely fascinating. It’s especially interesting that you can isolate the primary NRM ‘just’ through heating and cooling, taking advantage of the properties of magnetism. I had thought it would have been a far more complex process – although I am sure your simplified it for us in your description! Since you’ve started your research have you come across any intriguing results you can share with us? LRA: That’s a tricky one! I have, but the problem with it is, I’ve not published them yet, so I need to be careful quite how much I tell you! Despite that, I can give you a little taster. Previous research has suggested that a magnetic field must have been active in the Archean, 3.5 Billion Years ago, and I’ve been able to confirm that through my research. Just because you are able to isolate a primary NRM, it doesn’t mean it is as old as the rocks are. I’ve been able to prove, through using geological evidence and some tests, that the magnetisation held in ‘my’ rocks, is in fact 3.5billion years old. AA: Incredible. Well, we won’t pester you for results (we wouldn’t want you to get in trouble), but maybe once you’re able you’ll come back and tell us a bit more about what you’ve learned? It has been great having you here and it’s been very fun learning all about your research. LRA: Thanks so much for having on Penny University, it’s been brilliant! I hope I’ve inspired you to learn a little more about our planet and its magnetic field in particular! If you want any extra information, don’t hesitate to get in touch, check out my details below. 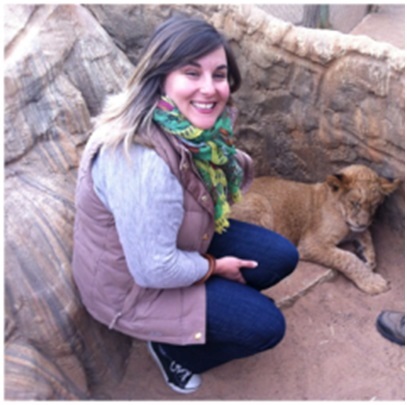 Laura, in South Africa, with something that is not a rock! Laura Roberts Artal is a PhD candidate at the University of Liverpool. She is studying 3.5-3.2 Billion year old rocks in South Africa. 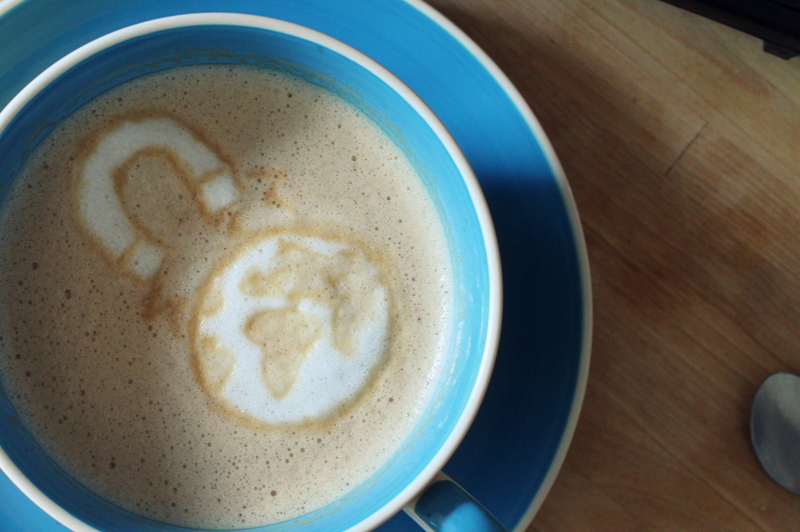 If you’re interested in learning more about Laura and her research, you can follow her on Twitter at @lauRob85, visit www.geomagnetism.org, or check out the EGU blog network – for a number of guest blog posts about the Earth’s magnetic field.